If you are looking for an eco-friendly alternative to grass and seriously feel the winter doldrums when your greenery turns brown with the changing seasons, a moss garden might be right for your yard. Martin is quick to explain, though, that mosses are not just green — they can be “all sorts of jewel tones,” such as gold, copper and crimson. For a long time, moss was seen as a pest for lawns. Now there is a movement to bring the lush, fluffy natural carpet back to yards. Mosses also help to sequester carbon, filter water and prevent erosion or damage from flooding. Typically, moss tends to thrive in cooler, moister areas, though the exact requirements for water and shade will depend on the type of moss you grow. Wallhead said to look for shadier locations, like forest understories, partially wooded areas and woodlines, or the transition zone between your yard and a shady forest. If your property lacks these resources, Martin and Wallhead suggested growing on shaded stone wall, around the skirt of a tree or on the north side of a building. Wallhead said to pick a spot where the soil is on the more acidic side. “As long as the growing substrate is below [pH] 7, it should be fine,” he said. Mosses could, in theory, grow alongside vegetables without harming them, but neither Martin or Wallhead necessarily recommend it for the health of the moss. The stability of the surface also matters. Wallhead said that sandy soil that shifts often with the wind and water can prevent the moss from anchoring down well. Wallhead said that when it comes to geography, moss will thrive in areas that do not have high wind, high intensity light or dramatic swings in temperature or humidity. For this reason, plus the percentage of forested land in the state, Wallhead said Maine is especially conducive to growing moss. There are thousands of species of moss that come in a variety of different colors and textures. Martin said that there are some mosses that are better for first time growers because they grow more aggressively than others — Thuidium delecatulum and Dicranum scoparium, she said, are especially good for the Eastern part of the United States — but in general, she said to choose your moss species based on your level of sun exposure. Martin said to watch your property carefully to see where the sun shines. Be especially cognizant of how shading changes on your land during seasonal changes when leaves fall off deciduous trees if that applies to where you live. Make sure you purchase moss from a reputable dealer that specializes in selling moss rather than going to a garden center. If you cannot find a source for moss near you, Wallhead said it’s relatively easy to collect and propagate. “If you know a property that would allow you to collect some, that’s probably the easiest way to do it,” Wallhead said. If you are collecting moss, Wallhead said to make sure you know who owns the property where you are gathering it. “If collecting to propagate make sure aware of local governances on collecting plant material and not taking it from parks and public spaces,” Wallhead said. Wallhead said to collect by raking it up or collecting clumps and then transplanting them to a new location by pressing the fragments into the soil surface and keeping them evenly moist. To propagate moss on soilless surfaces like a stone wall or a stump, Wallhead said to mix the moss with buttermilk and water, which help moss rhizoids glue themselves to the surface, and paint or spray the mixture onto the surface where you want the moss to grow. Martin suggested starting with a plot that is at least 2 feet by 2 feet, but she said moss is generally able to grow even in small space. Wallhead said to remove all weeds and unwanted plant material before you establish the moss. Make sure your moss garden receives adequate moisture. Because of their water filtration properties, mosses can also be watered with rainwater or greywater. Moreover, pesticides are not really necessary to maintain your moss garden. 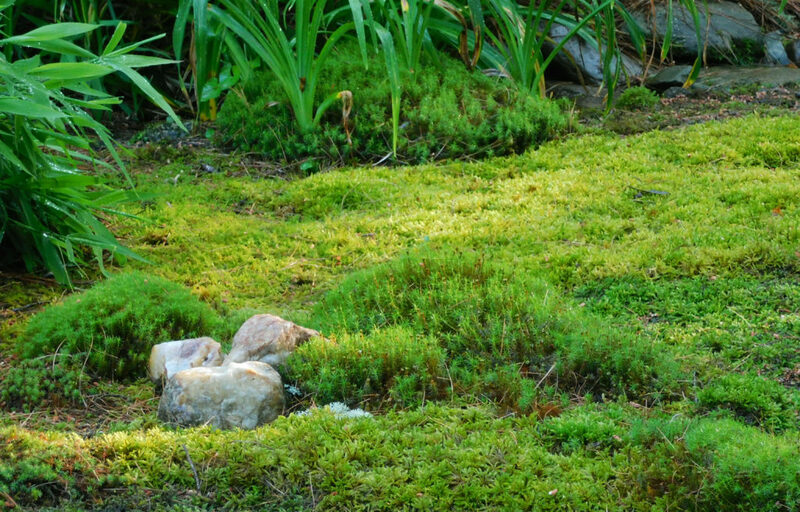 In general, a moss garden is a low-maintenance and beneficial addition to your yard. “They tend to be very low maintenance and quite forgiving,” Wallhead said.